After working for three years as a senior associate in the merger and acquisition transaction services department for Deloitte Financial Advisory in China, Yue Yu decided it was time for a career change. She wanted to go somewhere outside her native country. Yu graduated in 2015 from Central University of Finance and Economics in Beijing with an LL.B. and a bachelor’s degree in economics. She wanted to combine her working experience and business background with an LL.M. degree. Her future plan is to seek a job, not only with a law firm but also with an investment company. Friends recommended the University of Notre Dame to Yu because they had benefited from its strong alumni network. Yu also liked the idea of being involved with a tighter, smaller group of LL.M. students who come from a variety of different backgrounds. Therefore, she chose to pursue her LL.M. at Notre Dame Law School. Yue Yu is an LL.M. student at Notre Dame Law School. Photos by Alicia Sachau/Notre Dame Law School. Notre Dame’s campus itself offers students many rich experiences, too, she said. 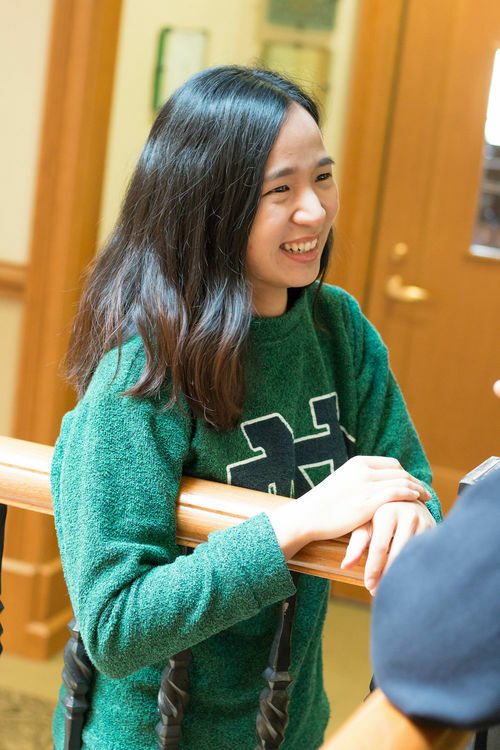 Notre Dame Law School, the Asian Law Students Association, and other campus organizations ensure that international students have many social activities to participate in on the weekends. For example, the English for Academic Purposes Program threw Notre Dame’s international students a Thanksgiving party on campus. Around Halloween, the LL.M. student services program director, Margaret Lloyd, invited the students over to her house to carve pumpkins. Yu said she has enjoyed learning from Notre Dame Law School’s professors, who are legal scholars and also have rich practical experience. For example, she said that Professor Julian Velasco is able to draw upon his past experience as a corporate attorney in New York City when teaching about mergers and acquisitions. She has also learned from Adjunct Professor John Griffith, who is executive vice president, general counsel, and secretary for 1st Source Corporation and 1st Source Bank. But it’s the interactions with her fellow students from the United States, Europe, and Latin America that she feels have provided her with the greatest benefit. Yu explained that everyone shares the various legal problems and solutions that their countries are dealing with. This exchange provides students with a global perspective on the law. For instance, one of the American J.D. students works for an organization connected to the U.S. Supreme Court, and Yu had the opportunity to learn a lot of business-related and securities-related law from him. Also, her Colombian roommate is studying international human rights and has presented Yu with new ways to think about law. In China, she did pro-bono consulting projects on corporate social responsibility for two major Chinese technology companies. Yu thinks she’d like to continue that kind of work when she returns home. Originally published by Alice Culp at law.nd.edu on February 14, 2019.